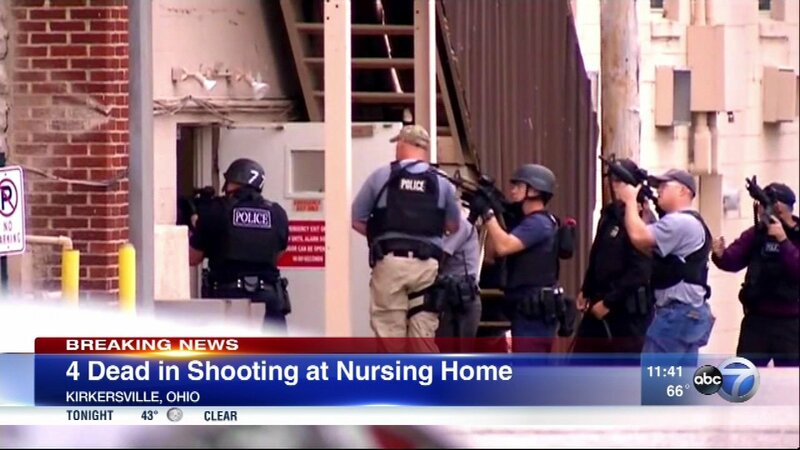 KIRKERSVILLE, Ohio -- The police chief of an Ohio village and two nursing home employees were killed Friday by a gunman who was later found dead inside the care facility, a sheriff said. The slain police chief was identified as Steven Eric Disario, who headed the Kirkersville Police Department, Licking County Sheriff Randy Thorp said. Disario, 36, had only been on the job for about three weeks, Thorp said. He was a father of six children, with a seventh on the way, the sheriff said. Thorp called it a hard day for all. "We've lost a police officer. It's just a tragic event. I guess the only peace of mind is that the threat is over," he said. By early afternoon, flowers and flags were appearing in an impromptu memorial outside the village police hall. Disario was responding to a report of a man with a gun, and his last radio communication said he had the suspect in sight, Thorp said. Responding officers found Disario on the street and then investigated a report of a gunman in the nearby Pine Kirk Care Center, Thorp said. Two employees of the center and the suspected gunman were found dead inside the nursing home, the sheriff said. Some residents barricaded themselves during the shooting, but none of them were injured, he said. He said police weren't immediately able to positively identify the gunman and were trying to determine what, if any, relationship he had with the nursing home. The shooting closed down the main street in the village, which was flooded with police officers from several surrounding agencies and with ambulances. The village of about 500 residents is roughly 25 miles (39 kilometers) east of Columbus. "This is a really small town and everybody knows everybody," Kirkersville resident Debbie Messer told the Columbus Dispatch. "These things don't happen here." Pine Kirk is licensed for 24 patients and had 23 as of May 3, according to Ohio Department of Health records. A message was left with the center. The state Bureau of Criminal Investigation is leading the probe into what happened. Gov. John Kasich expressed his condolences in a tweet. "Join me in praying for his family, friends and colleagues, and for the others injured in this tragedy," the governor said.